If you're not sure what to do on Saturday, it's Public Lands Day and you can get in free to some National Parks. See the list here. The closest is Muir Woods. Okay, this isn't actually a tourist thing, but I had to mention it. Regal Movie Theaters (including United Artists theaters) are offering ticket deals at half off. For $13 get two movie tickets. Read the fine print. No expiration date. $29 for a holiday twilight cruise (normally $58), includes food, drink, live music. Good November 4 through March 31. $16 for TWO tickets (value $32) for this Fisherman's Wharf favorite. This Oakland company takes you on two hour boat tours (a rigid inflatable motor boat) to see various historic buildings, island and ships in day or at night. $69 allows two passengers or $139 for four. Enough with the boats already. Take an aerial tour for $199 instead of the usual $400, and you'll get a one hour Bay Area tour for up to three people. Wishing you and your family a G'mar Hatimah Tovah, an inscription in the book of life and a good year! May you have an easy and meaningful fast. Never heard of an autogiro? Me either! Hiller Aviation Museum in San Carlos is featuring these flying machines on Saturday, September 29 in a special day of activities featuring the earliest rotary-winged aircraft. These were the leading aircraft designs from the 1920s into the 30s. And Amelia Earhart set an altitude record flying one at 18,000 feet. They look like funky helicopters. I'm posting this because a friend I trust is participating in the study, and her daughter has found it interesting. If it's of interest to you, please contact the researcher. We've done medical studies with our kids before, and it's a good learning process for them, to help them understand how the research helps us discover new treatments, new medications and how the body works. I work on breast cancer-related research studies at the Cancer Prevention Institute of California, a non-profit organization in Fremont, CA. The new study I am working on is currently recruiting girls ages 6-13 to participate in a 5-year study aimed to look at things we can do to prevent breast cancer starting from a young age. This is truly cutting-edge research, especially if there are indeed things that children (and their parents) can do to reduce their risk of getting cancer as adults. The study is funded by the National Cancer Institute and is called the LEGACY Girls Study. We are trying to recruit 270 girls here in the Bay Area as apart of a national cohort study where researchers are aiming to follow them throughout all stages of the pubescent and prepubescent life. We have already recruited 100 girls! If you or your friends/family members have a daughter who is 6-13 years old living in the Bay Area, we would absolutely LOVE for her to participate in our study. Some details: If you and your daughter agree to participate, there will be a female interviewer who will come to your home and 1) ask your daughter general questions about habits and exercise 2) measure your daughter's waist, hips, height, weight, and foot size and 3) if your daughter is willing, collect a urine and a small blood sample. Although a blood sample is not necessary to participate in the study, it is a very powerful tool that helps us link biology to behavior and cancer risk. Both you and your daughter will receive gift cards to fun places like TARGET at each visit as an appreciation for your contribution to the study. More importantly -- everything is strictly confidential! I've attached a 2-page brochure about the LEGACY Girls Study (Frisco Kids note: obviously that's not attached here, nor do I have a copy) and here is the link to our website: www.legacygirlsstudy.org. The folks leading this study, as well as the interviewers, are AMAZING and they have done a great job making everyone who participates feel comfortable and well-informed about the whole process. If you are interested, feel free email or call me (my work contact info is below). I would love to speak to you more about it. Alternatively, if you know others who would be interested, please pass this message along to them. Want to be part of a Guinness World Record attempt? Here's your chance. Help break the Guinness World Record for the most soccer balls ever dribbled at one time! The Great America SCORES Soccer Dribble will bring together the Bay Area soccer community with nine other American cities to break the record. Currently it's held by the United Nations, with 2,068 simultaneous dribblers. That day, the Great America SCORES Soccer Dribble will also feature individual soccer competitions hosted by iSoccer, soccer clinics and demos, live music and concession stands. When: Saturday, September 29 at 2:30 p.m. Other even festivities run from 1-4. Cost: $5 admission. For $15 you also get a commemorative t-shirt, and for $25 you get admission, a t-shirt and a soccer ball. All proceeds from this event benefit the youth of America SCORES! Get ticketss at any San Francisco Sports Basement store or online. Postscript: Sounds like Feedburner IS still working, since readers report getting this post via email. Phew! There is a lot of confusion right now in the blogger world because the last few days of Feedburner data show that we have no subscribers, and there's a lot of information/misinformation floating around about the Feedburner API discontinuation in October. Turns out that may or may not affect us. If anyone is knowledgeable about this, please do tell. Web stuff isn't my strength. In any case, I was able to download a subscriber list from a few days ago, which at least gives me backup in case something does happen. I'd hate to lose anyone! Thanks to the readers who provided me with confirmation that it's still working. I just got notice (from another blogger, not from Feedburner) that Feedburner was cutting off service on October 20, 2012. Well, it's September 21 and my Feedburner list is officially at 0. Yes, they cut off and deleted my account with no notice. I will be looking into new subscription services, but if you get your subscription by email (I'm not sure if RSS is affected) and are checking to see where all the blog posts went, keep checking while I figure out a solution. I apologize for the inconvenience, and for not backing up my list since February, 2010. Yes, I should have backed it up more recently. I'll send everyone on that list an email when I have more information. For more recent subscribers, my apologies. In the meantime, if you have ideas for good subscription services, please let me know. We eat a lot of bars in our house. As in cereal bars. I once cut out a recipe so I could make my own. Ha ha! Why would I do that when I barely have time to make our dinner? So I thought I'd give the Frisco Kids' scoop on snack bars. Rickland Orchard's Greek Yogurt Bars - I tried these at BlogHer and they were quite tasty. My favorite is the toasted coconut one (though it has a fair amount of fat, not surprisingly). The bars have dried fruit, granola and are coated on one side with Greek yogurt (and a pretty drizzle on the other side). Downside: they don't do well in heat, so it's not a good one to carry around in the purse as a back-up snack or the yogurt coating melts. They have 5 grams a fiber in each bar, a bonus in my book. Fiber One bars - we started buying these when our pediatrician recommended them as a fiber supplement to my son's diet. The bar has 9 grams of fiber (she also recommended the 90 calorie Fiber One brownies, which have 5 grams of fiber). He eats one a day for snack. His favorites are the peanut butter ones, but they don't have those at Costco, so we're sticking with chocolate unless I can get the others on sale. MySuperSnack bars - This new company (MySuperFoods) was started by two moms who wanted healthful bars that didn't have additive or preservatives, and they sell the bite-size granola bars in a resealable BPA-free bag (in case the kids don't finish what they're eating). They sent me two sample bags to try - each bag is a single serving with 4 small bars each. They taste like chewy oatmeal cookies - yum! I couldn't get my kids to eat them because they said "apple raisin" and "blueberry banana acai" on the outside of the bag, and my kids can read (my son is not a big fruit fan). They also carry chocolate chip bars, but I didn't get samples of those. The packaging has cute cartoon characters (super food heroes) on it, which is good for the preschool set. Quaker Oats chewy granola bars - these are staple at our house, along with their Target generic equivalent. We tend to get the big box at Costco, though those have the raisin ones in it and my kids won't touch those (we donate them to the food bank). We like the s'mores one too. The bars have 90-100 calories, which is not enough for snack. My kids usually take two bars - more waste, but no more grumbling tummies. Nature Valley Granola bars - the kids love the chocolate ones (chocolate flavoring, not coated), which Costco sometimes sells. They're hearty enough for a snack and there are two bars per pouch. They solid and not chewy, so some kids may not like that. They travel well because they don't get mushy and they don't melt. They may break apart, but you can still dump the crumbs in your mouth. Their chewy peanut ones are good too, but we have to be careful about sending nut products to school. The Zone Perfect bar - I love these and snack on them. Even though I'm not on a diet. I keep them in my gym bag in case I'm starving after my workout. Any of those covered in chocolate are good by me. Power Bars - my hubby and daughter's favorite. These are great to travel with and we bring them on hikes and to amusement parks (they're thin enough to sneak in your clothes if the park doesn't allow outside food). I like the chocolate, chocolate cookie and vanilla crunch ones best. Smithsonian Magazine's Museum Day makes it possible to visit some great museums - for free! They do this annually, and this year's is on Saturday, September 29th. Download an admission card here, and get into museums like Bay Area Discovery Museum, Hiller Aviation Museum, CuriOdyssey, Cartoon Art Museum, Bedford Gallery, Museum of Craft and Folk Art, Lindsay Wildlife Museum, SS Jeremiah O'Brien, the Lace Museum, and others. I wanted to pass along some offers that came through my affiliate network that you might be interested in. My iPod is full of podcasts, not much music! I spend my time walking to/from school listening to books and podcasts to catch up on reading (and writers' conference panels). So I was interested in this Audible deal, where you can get a month free and a free audio book. If you like it and stay a member, you pay a monthly fee. If you're into daily deals, Zulily has very cute baby and kid stuff - click on the picture below to check it out. They have their annual "disguise" sale with things up to 65% off right now. You can use code ZUGA912 to save $5 off of $50 purchase. Nielsen Consumer Panel - the Neilsen scan sounds familiar, right? This is the same company that tracks TV watching. They have a home scan program where if you qualify, they'll send you a scanner for stuff you buy for your home so they can track purchasing trends nation-wide, and you can participate in surveys. By doing so, you get points you can trade in for electronics, toys, household items, jewelry, etc. I've not done it, so I can't vouch for what's involved, but if you sign up, let me know how it goes. To join, click the photo below. One focus group for today, on commerce. It's for Plaza Research in SF. To try and qualify, fill out the survey here. 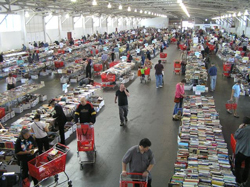 If you're a book lover (I can't imagine anyone who isn't), there's a huge book sale coming up to benefit the San Francisco Public Library. All children's books are $1 or less. Adult hardcovers start at $3, and paperbacks start at $2. Sunday, the books are all $1. They expect a crowd of 15,000, and they expect to raise about $250,000. On stock: more than 500,000 books, DVDs, CDs etc. When: September 19-23. Members preview is September 18. It opens to the public Wednesday, September 19, ends on September 23. Did you know today is Pi in the Sky Day? There will be skywriting planes above the San Francisco Bay Area which will create "Pi in the Sky," which they say will be the world’s largest art installation. It's happening today, between 11:45 am and 1:30 pm. Five synchronized skywriting planes will draw the first 1,000 digits of the infinite sequence of pi (π) – the ratio of a circle's circumference to its diameter at 10,000 feet in the air. Using dot-matrix skywriting technology, the aerial numbers will measure a quarter-mile tall and extend more than 100 miles. Follow along on twitter @piZone_dot_org. Now that the kids are back in school, you might find yourself with a few extra hours here and there - even if you're working. I know, not many, but even those volunteering at your own kids' school can get involved. Science is Elementary is an elementary school science program where volunteers go into the classroom to teach fun (but educational) science lessons that kids wouldn't get otherwise. I don't think I have to tell you about the budgetary issues in California. And how kids in the U.S. are thought to be far beyond those in other countries in science education. In their words, "Volunteer groups of engineers and scientists (1 adult per 5 children) bring "cool" hands-on experiments to the classroom and allow children to explore on their own while asking directed questions to guide their thought processes and investigations. Experiments draw on children’s everyday experiences to show them that science is all around them and is fun." Science is Elementary is recruiting volunteers (mostly scientists, engineers and healthcare professionals, though I know a teacher who does it) for the upcoming school year. If you, or someone you know, could volunteer only TWO HOURS a month, it would make a huge difference in kids' lives. (Many jobs allow employees time off to do this kind of volunteer work). And the curriculum is already planned. The schools involved are in Mountain View and Santa Clara. See the FAQ's about the program here. Please forward this to anyone you know who might be interested! I just wanted to take a moment to remember those who lost their lives in the horrific events on 9/11/01. Those on flight 93 en route to San Francisco. Those on flight 77 and the those lost in the Pentagon. And those in flights 11 and 175, and those lost in the World Trade Centers. Plus those who lost their lives from the recovery and clean-up efforts. This is the Empty Sky memorial in Jersey City, NJ, dedicated last year. My photo was taken late August, 2012, and you can see the Freedom Tower (still under construction) rising to the left of the memorial. Looking through the Empty Sky memorial, you can imagine where the Twin Towers once stood. This Saturday is California Coastal Clean-up Day, which runs from 9 a.m. to noon. There are many participating sites, and you should contact the coordinator in advance. Find out more here. Marin: Rodeo Beach - sign up here. San Mateo County: sites in Belmont, Pescadero, Redwood City, San Mateo, South San Francisco and many more - sign up here.